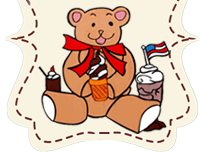 Made with rich delicious vanilla and chocolate ice cream with fudge and chocolate crunches in the middle top with smooth delicious whipped icing and Splashed with chocolate sprinkles and chocolate sauce and favorite colors for decorations. We can make all cakes to your order and imagination. © Copyright 2019 Debbie's Soft Serve. All Rights Reserved.